The Ionian coast extends from Izmir in the north - where it meets the Aeolian coast - till Bodrum in the south where it borders with the Carian coast. The Ionian coastline can boast one of the best climates in the whole of Turkey, and in antiquity these shores brought forth many great minds and a flourishing culture and history to match. And while this yacht charter area commends itself to the modern day sailing tourist, already in ancient times it was known for its joi de vivre and sprightly atmosphere, which is nicely exemplified by the grace and charm of the Ionic order. 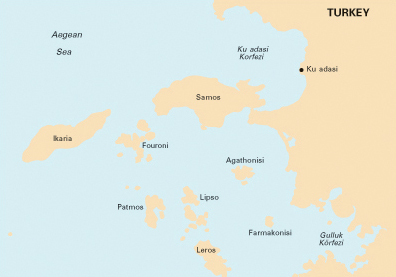 The Ionians settled in city-states along these Turkish shores around 700 BCE. Well separated from ancient Greece they opened up to foreign influences and ideas that originated further east and south. Thales made several journeys to Egypt for instance and here the people of Ionia learned geometry, while in the east they acquired astronomy from the Babylonians. 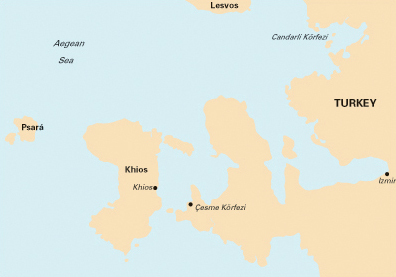 Ionia (Ιωνία) on the western coasts of Anatolia - Turkey - was comprised of a narrow coastal strip and river mouths. 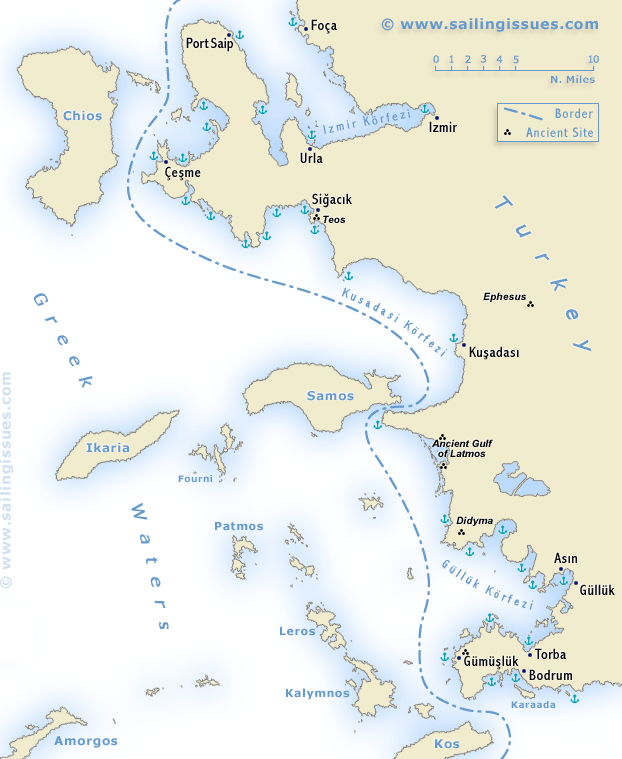 Moreover, it included the islands of Chios and Samos (see sailing map). Both Ionic and Ionian are used as adjectives to describe this ancient culture and modern day coast. In the 6th century BCE, armed with these new instruments - the Ionians no longer adhered to the mythological explanations and the traditional images of their gods, placing more and more faith in their own reasoning power. Indeed, the Ionian philosophers where to first in their attempts to explain the origin of matter, without falling back to magic and gods. Thus creating the foundation of modern science by asking questions like: What drives the day and night cycle? , How can one explain the seasons? , What is the origin of man? and what is the origin (Arche) of the world? Three so-called materialists came up with famous answers. Thales wrote his famous cosmological doctrine, which held that the world originated from water. Anaximander offered up the theory of the apeiron in direct response to the theory of Thales. Anaximenes held that the air, with its variety of contents and its vague associations with the phenomena of life and growth, is the source of all that exists. And although these theories where proven wrong, the importance lies in the acknowledgement that behind a confusing world rules and principles are to be discovered. Hence the word cosmos an ordered unity. These ideas which deal with the explanation of the phenomenons (and not with ethics for instance) where the bases of Western culture. The Ionian is ideal for yacht charter holidays like (bareboat) charters and gulet charters. The area is famed for its climate, and is as beautiful and gentle as it was in ancient times. You will encounter less (charter) yachts than in the Carian and Lycian coasts, also fewer local boats since the local economy is primarily based on farming the fertile shores, and not by fishing. 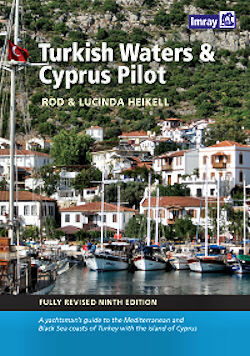 Highlights are the harbours and anchorages of Foça, Izmir, Urla, Port Saip, Çesme, Sigacik, Kusadasi, Asin, Gulluk, Torba, Bodrum as well as the archaeological sites of Teos, Ephesus, Latmos, Didyma and Gümüslük. Moreover, you can easily cross to the Eastern Sporades: Chios, Samos and Ikaria or to the Dodecanese: Leros, Kalymnos and Kos. Port of entry are: Chios, Samos, Kos in the Greek waters. And along the Ionian coast the ports of entry are Izmir, Çesme, Kusadasi, Güllük and Bodrum.